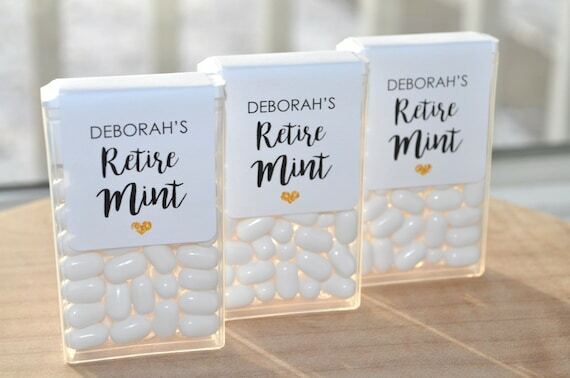 Thank guests with these adorable Tic Tac mint favor labels. Perfect for retirement parties, personalized with the honoree's name. Printed on matte finish, self-adhesive labels. Size is 1-1/2" x 4" with rounded corners. Design is the same on the front and back. Fits over Tic Tac label on a standard 1oz. size container. One set includes 24 labels. Just peel off the top paper label. Do not worry about any adhesive left behind. The new labels will cover that up. You may choose to leave the manufacturer’s label on. The size will cover the label, but the manufacturer’s label may show through slightly.